We spent a lovely weekend in Newport celebrating the marriage of our dear friends Matt and Jaimie. Camera issues seem to have arisen as I can only find one photo of the weekend that is not the ladies getting ready. Jenni was (co) maid of honor so we knew Friday afternoon was likely our only time for a tourist activity in Newport. We parked at Easton’s Beach for the Cliff Walk which runs along the ocean and past some of the magnificent estates for which Newport is famous. Tours are available for several of the homes (Breakers is probably the most well-known) but we had limited time so we just walked and gawked. This is a beautiful area, but I did experience another bout of shame for government to coincide with the federal shutdown. A long stretch of the walk remains closed due to damage from Hurricane Sandy. Of course it was a devastating and tragic storm, but this was a year later. And the website for the Cliff Walk as I write this says it will be closed until June 2014. Seriously?! We are not talking about an astounding marvel of engineering here. It is a sidewalk that runs along the water, and it is a major tourist attraction. I was stunned this could not be repaired promptly. OK, done venting. 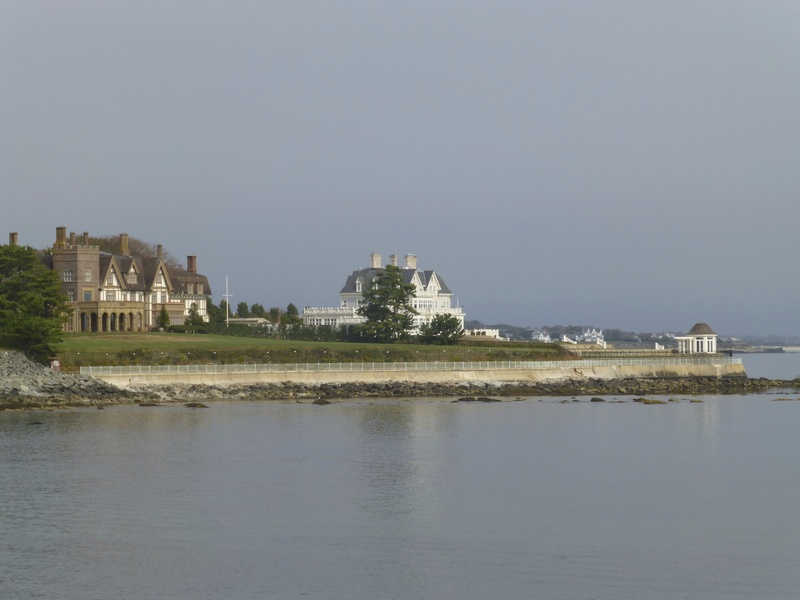 Anyway, there were meters where we parked and it was nice to do the whole walk but I think you could park closer to the big mansions near Narragansett Ave which may also be free. Oh, we jumped the fence and walked the closed part, too. We stayed at the Hotel Viking which was very nice and had a great location on Bellevue Ave, a main street just up the hill from the waterfront. For you tennis fans, the hall of fame with grass courts is just up the road. Across the street from the Viking was a nice spot for a late lunch called Le Petit Gourmet. The welcome party was at the Newport Harbor Hotel and afterwards a big group went to the Rhino Bar for drinks and general debauchery. We partied with the pirates there (true) before walking back to the hotel late at night. The block where the hotel sits looks like a small town in England or Ireland (I am imagining this as have only been to London) which makes it pretty neat to sit on the brick patio and absorb the surroundings. The next day I was hurt and did not do much other than Boardwalk Empire and some college football. On my way to the ceremony at the chapel around the corner, I had just my second exciting chance encounter of the trip. I saw Dana, one of my favorite law school compatriots who I had not seen in several years. The wedding was a blast and they had a great DJ who played lots of 80s and 90s music and especially hip-hop. I was impressed how many guests knew all the lyrics, both guys and gals. My optional tuxedo was very well-received, and that made me happy. It ended up being a late night between the after-party at the bar, the after-after party in their suite and the after-after-after party out on the patio. I was schooled in the way of McGillicuddy’s and Irish exits. Kait’s fiancé Sean told me about this car show in the UK that sounds fun, I am not certain but think it is the Goodwood Revival Car Show. The next morning we said goodbye before hitting Wendy’s drive-thru and some back roads to Longmeadow, where I grew up. I really enjoyed getting to know Matt and Jaimie’s families and friends. It was a great group and a wonderful celebration! This entry was posted in North America, Rhode Island, Uncategorized and tagged Newport, Rhode Island on November 16, 2013 by aleavitt77.